Takeaway: Joe Satriani has incredible technique. But he also plays very melodic is a master of creating moods and atmospheres. In this song he uses the Lydian mode to great effect. If you haven't learned/mastered Lydian yet, get started with it. It's an extremely useful scale to know and belongs into every guitarist's toolbox. Joe Satriani said in interviews that this song is all about a recurring dream he initially had as a child. A dream of flying where young Joe would start out in his room and over time end up in a translucent and crystallized blue dream world. When he was working on his Flying in a Blue Dream album such a kind of dream, a Yamaha steel-string guitar (in Open-F tuning: C-F-C-F-A-C) he recorded the acoustic parts with and his mood on that particular day came together to help him create this masterpiece. Yes, there are modifications like a bVI chord (Ab in this case) but in essence, the song follows a Blues progression. Instead of the common dominant 7th chords, Satriani heavily features the #11, both in his chord voicings as well as a main melody note. The #11 is the characteristic note of the Lydian mode. 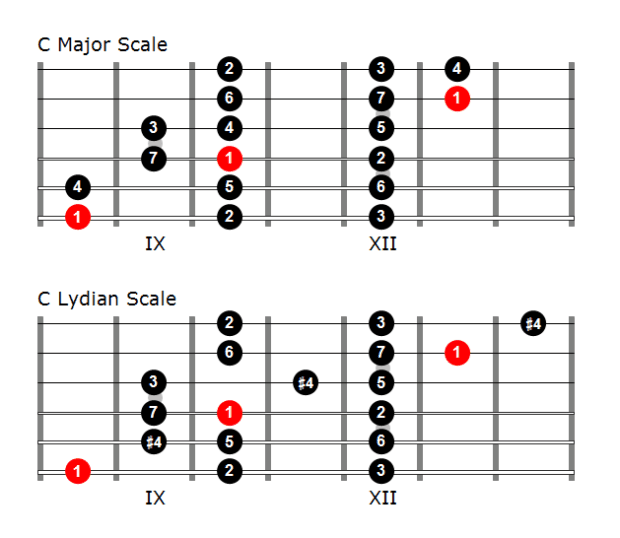 In case you don't know: a Lydian scale is similar to the conventional major scale, the only difference is that the 4th note is raised by a semi-tone. This raised 4th (which equals the #11) gives the scale that dreamy, mystical sound. This mysterious sound is the perfect choice to represent Joe's dream. So learning Lydian is not too difficult, if you know your major scales. You just need to become aware of that 1 note difference = instant recipe for Lydian. What Other Lydian Songs Do You Know? Since Flying in a Blue Dream almost exclusively features the Lydian mode it is a great track to internalize the sound of Lydian. No kidding, one of the best methods of learning a mode is to have a song you know and like as a reference point. Try to get to a point where you can imagine the sound and feel and recall the association to the mode. This will make it a lot easier for you to recognize the mode when it's used in other songs.